Voice services such as Google Voice, Siri, and Cortana have been steadily making their ways into our lives, helping us find information on the internet or reminding us of a friend's birthday. Now, Amazon has created the first voice service for at home use. 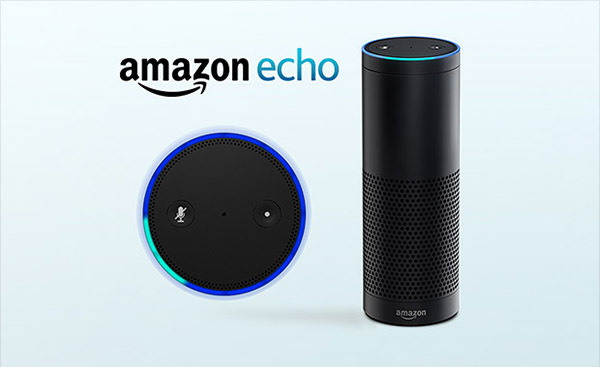 Their new product "Echo" is designed to respond to your voice commands as well as answer your questions. In order to wake it up from it's idle state, you must first call it by it's name, Alexa. Filling the room with high quality sound, Echo is fine-tuned to give you crystal clear vocals with dynamic bass. It is designed with dual downward-firing speakers that produces sound in a 360 degree omni-directional path. Hidden under the top LED ring are seven microphones that use beam-forming technology in which Echo will be able to hear your voice from any direction within the room. With it's enhanced noise cancellation, Echo is capable of singling out and responding to your voice even while the music is playing. Connected through WiFi, Echo will have complete access to Amazon Web Services allowing it to continuously learn and add more functionality to itself over time. Over time, Echo becomes more personalized as it learns to adapt to your speech patterns, vocabulary, and personal preferences. Having access to Amazon Music, Prime Music, iHeartRadio, and TuneIn, Echo will be able to access your playlists as well as suggesting music for you to listen to. This new device also comes Bluetooth-enabled so you can stream other music services such as Spotify, iTunes and Pandora from you phone/tablet. With your phone connected, you will have access to the companion app where you will be able to manage your alarms, music, shopping lists, and much more. It also provides news and weather updates from selected channels that range from local radio stations to major stations such as ESPN. The companion app is available for Fire OS, Android, and iOS. Amazon's Echo device is currently being sold for $199 to customers and $99 to Prime Members. The product is currently on a wait list that you must sign up for on the Amazon website. I'm considering buying one of these. It does a lot for something of such a small size. The only thing I don't understand is why call the device Echo when it responds to Alexa.